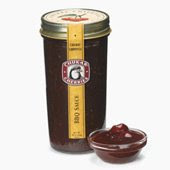 This sauce was used on pulled pork, turkey, babyback ribs and brisket that were all cooked low and slow over cherry wood. The opinions are both mine and Will Breakstone’s, owner and pit-master of Willie B’s Award Winning BBQ. I have been having great luck in finding little gems that are off the BBQ beaten path. This product is a wonderful addition to a growing array of non-traditional sauces. It’s not surprising that the sauce is good as it comes from a company that specializes in cherries and their use in gourmet foods. The aroma is surprisingly mild. I didn’t pick up much of the chipotle, which would have been nice. Thankfully, the sauce lacked the all too frequent ‘artificial’ smell that can be found in many mass produced sauces. This is a sweet sauce, make no mistake about it. It’s an enjoyable sweetness that is on par with the sweeter of the Kansas City style sauces, but much of that taste seems to be derived from the cherries as opposed to refined sugar. The sauce went well with all of the meats, but was an amazing glaze on the ribs. The sauce might offer too powerful of a cherry taste and be a bit too sweet for chicken, but it stood up well to the stronger meats such as brisket. I did use it sparingly on turkey and it was great as a substitute for the traditional cranberry sauce. I would have preferred a more prominent chipotle taste, but I recognize that this is strictly a personal preference. The chipotle added a nice undertone and provided the sauce with a depth and balance that would otherwise be missing. The sauce was a bit looser than a traditional KC sauce and came in a very nice glass bottle. The label was elegant and understated. The sauce was $8.95 for 13oz.